A backpacker’s happy place and a writers dreamland, Kausani is one such village of Uttarakhand which is also enjoying its stature as a quaint hill station. Cradled under the sheath of the crimson sun and the dark green hills, Kausani is known for offering a panoramic view of the massive Himalayan peaks such as Trishul, Nanda Devi, and the mighty Panchachuli peaks. The beauty of Kausani has also bewitched some the eminent personalities of India including Mahatma Gandhi the 'Father of the Nation'. It is said that when Mahatma Gandhi visited this place, he was so much allured by its aesthetic beauty that he called Kausani the ‘Switzerland of India’ as it has a strikingly similar landscape to that of Switzerland. The glory of the snow crowned Himalayan range reaches its pinnacle when the sun rays turn them into gold at morning and red-orange sky at the sunset. 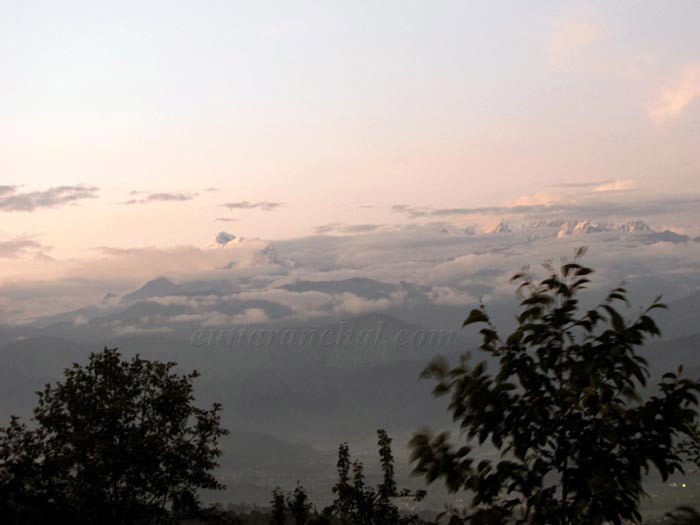 Kausani is an ideal winter destination and hill station to welcome the new year. The winters are best time to get an uninterrupted view of the majestic Himalayan peaks. Showcasing the natural beauty of the alpine hills, the bubbling creeks and the snowy Himalayas, the tiny hamlet of Kausani is truly a 'nature lover’s paradise'. Here, the day unfolds with the melodious chirpings of the playful birds and ends with the sweet lullaby of the gentle winds. Kausani is located in the proximity of Delhi making it as an ideal weekend destination and is emerging as a honeymooner’s delight as well. The couples can engage in several recreational activities here such as birding, photography, village walks or go for an adventurous hiking to Rudrahari Cave temple. Some of the popular tourist attractions of Kausani are the Ananshakti Ashram, Sumitra Nandan Pant Museum, and the Lakshmi Ashram. For spirituality, one can visit the Baijnath temple, Someshwar temple and Bageshwar temple located in the vicinity of Kausani. On your visit, don't forget to buy the local handicraft items such as the Kausani shawls made in the Kausani Shawl Factory. Museum Visit: Kausani is famous for a museums dedicated to Mahatma Gandhi in Anashakti Ashram and home-turned-museum of famous poet Sumitranandan Pant. These museums showcase personal work, items and other memorabilia for public view. Nature Walk: Kausani is enveloped in lush greenery that makes it a perfect place to explore the beautiful surroundings with family and friends. You can also enjoy the panoramic view of the Himalayan peaks of Trishul, Nanda Ghunti and Nanda Devi from the vantage of Kausani. Shopping in Kausani: There is a small local market in Kausani. You will not find big brands or shops. But you can buy Kausani Shawls hand made by villagers in Kausani Shawl factory. You can also buy tea of Kausani from Kausani Tea Estate. One can also buy handicrafts, pickles, marmalades, jams and woolens from Kausani. Village Tourism: Kausani not only offers scenic views of the snow clad Himalayas and ample natural beauty but is also known to encourage and promote village tourism in the region. Tourists can learn a great deal about the rural life, art, culture and heritage that pervade the Himalayan regions. Kausani has been turned into an eco-friendly destination for tourists to learn and explore about the culture and rustic yet charming way of life in the hills of Uttarakhand. Not only ecotourism is a sustaining way of traveling but also creates an everlasting bond between man and nature. Kausani is an ideal weekend destination from Delhi NCR. For tourists and honeymooners who had enough of Nainital, Kausani is an alternative destination that is much more serene, tranquil and away from hustle-bustle than Nainital. Kausani is known for its various types of fruit orchids. One can purchase apples, apricots or pears from the farmers directly during the fruit-season (May-August). Kausani is a popular tourist destination and thus attracts large number of tourists and backpackers to this place. 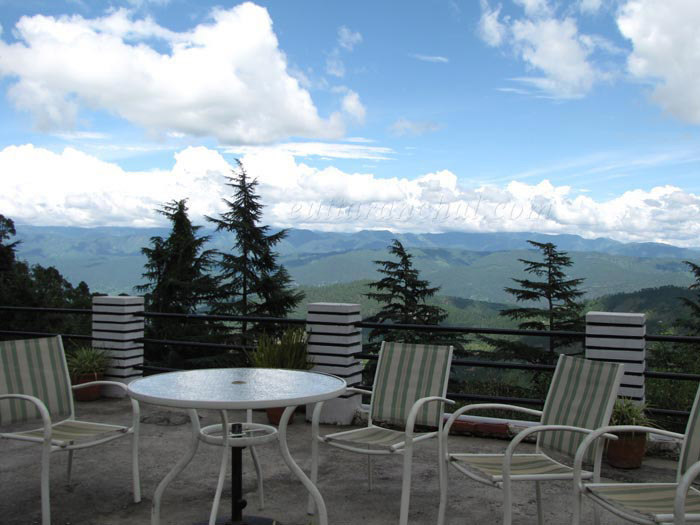 As a result there are adequate accommodation options for tourists to stay at Kausani. One can find luxurious hotels and resorts as well as budget guesthouses with limited amenities. The facilities may vary from hotel to hotel. Some resorts also offer tent accommodation. Few local restaurants and roadside dhabas have mushroomed at Kausani however, finding a proper restaurant with variety of cuisines is little difficult. At best, in-house restaurants at your hotel and resorts may provide you with some culinary delights. The local restaurants offer mainly north Indian dishes along with popular Chinese items like noodles, Manchurian etc. The magical Kausani which bewitches the backpackers with its kaleidoscopic beauty was referred to as 'Valna' in the good old days. It is said that at Valna, was the place where the prosperous Kingdom of Kartikyapur existed. Kausani is also the birthplace of Sumitra Nandan Pant, the most celebrated and legendary Hindi poet of India. Kausani has been visited by many eminent personalities of the past such as Mahatma Gandhi, whose memory is kept alive in the form of Anashakti Ashram. Mahatma Gandhi, during his stay at Kausani, penned his memorable commentary on the 'Gita-Anashakti Yoga' inspired by the scenic grandeur of this richly gifted spot. Mahatma Gandhi was so much impresses that he started calling it 'Switzerland of India'. The tranquil hill station of Kausani is nestled with love in the Bageshwar district of Uttarakhand. This beauteous hill queen is perched at an elevation of 1,890 metres and is known for the Kausani Tea Estate which grows the best quality tea leaves. This scenic place is also the birth-place of the famous Hindi poet, Sumitra Nandan Pant who wrote many poems, praising the beauty of Kausani. Since Kausani is known as a popular winter destination, it is advised to visit this place in winters to witness snowfall. What is Kausani famous for? Kausani is famous among tourist as Hill Station and Peaceful Surroundings. Kausani is recommended destination for Couples, Family and Kids, Foreigners, Solo. Kausani is popular destination for following activities/ interests - Christmas and New Year, Hill Station, Honeymoon Destination, Leisure, Weekend Getaway.